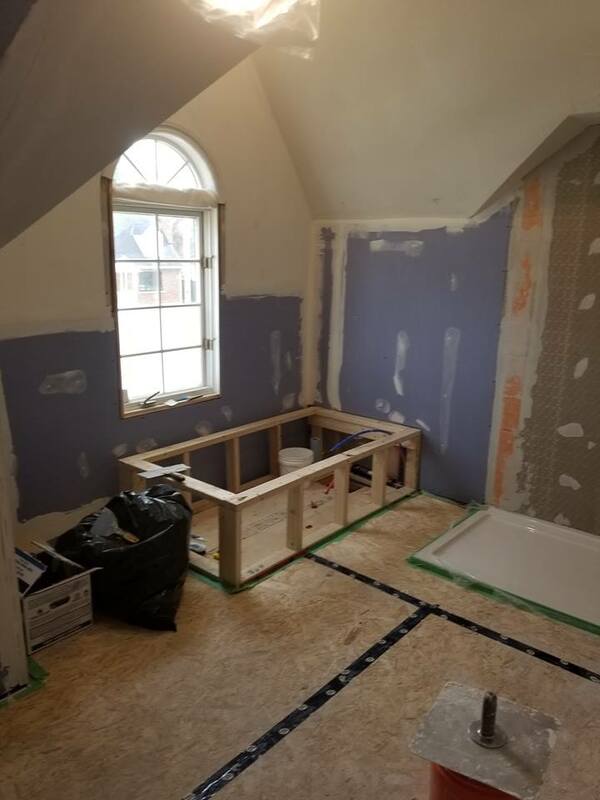 One of the great things about being away for the winter is that I can have renos done at home and I do not have to live through it…it is an even BIGGER bonus when your trustworthy son is doing the renovation for you. Our main bathroom has been in dire need of not just an update but a full-blown renovation. I really hadn’t thought of doing it this winter but here’s what happened. Some of you know I have crazy back issues….our laundry room is in the basement. Laundry has to be carried up and down two flights of stairs. Steve hated me having to make the trek – he is always worried I am going to hurt my back further. He obviously helps me bringing the loads up and down but it wasn’t easy on him either. Old house means low ceilings especially in the basement when it drops down to accommodate the ductwork. You know what I’m talking about right? Anyways…Steve was determined that I would have a laundry room upstairs where it makes sense. I didn’t want to take away from the clothes closets. In our hallway, however, there is a small linen closet. It turned out to be the absolute perfect spot for a small stackable washer/dryer set. It has access to the attic for the drier to vent through. 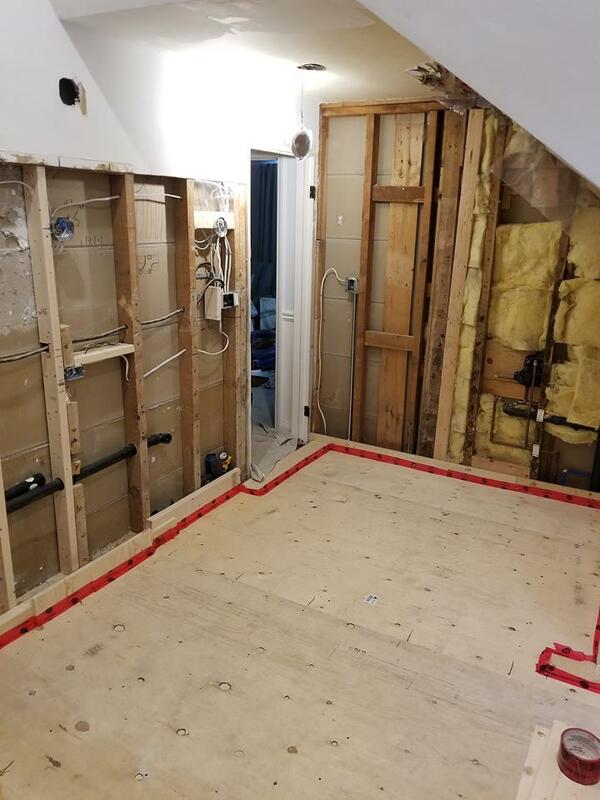 It also had access to plumbing…well…with a small little itty bitty tweak….all we needed to do was blast through one of the walls to get to where the tub was on the other side. Hence the bathroom reno!! Everything just fell into place. I called my son, showed him my inspiration photo above and Steve wrote the check….easy peasy. 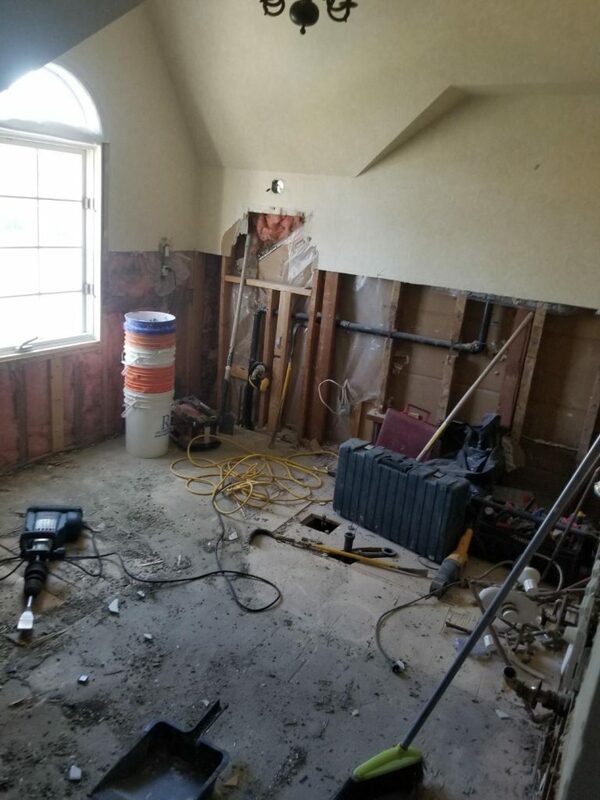 I am going to share with you the before photos and a host of problems we had with this bathroom. 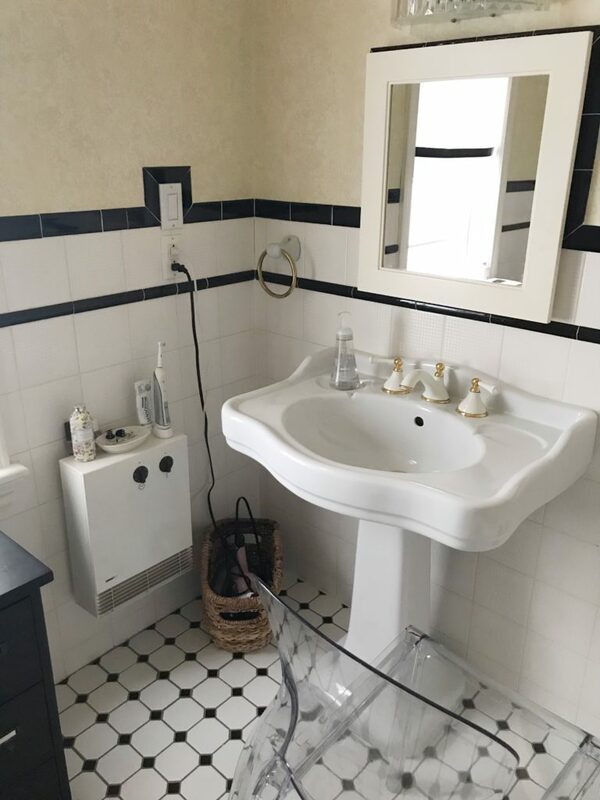 This photo shows the majority of the bathroom space. I never hated it…I think it’s saving grace was the fact that it was so traditional with all the black and white. I am sure you have noticed in so many magazines that black and white is back in style in a big way! I was going to stick with it…but changed my mind…I hope I don’t regret it! 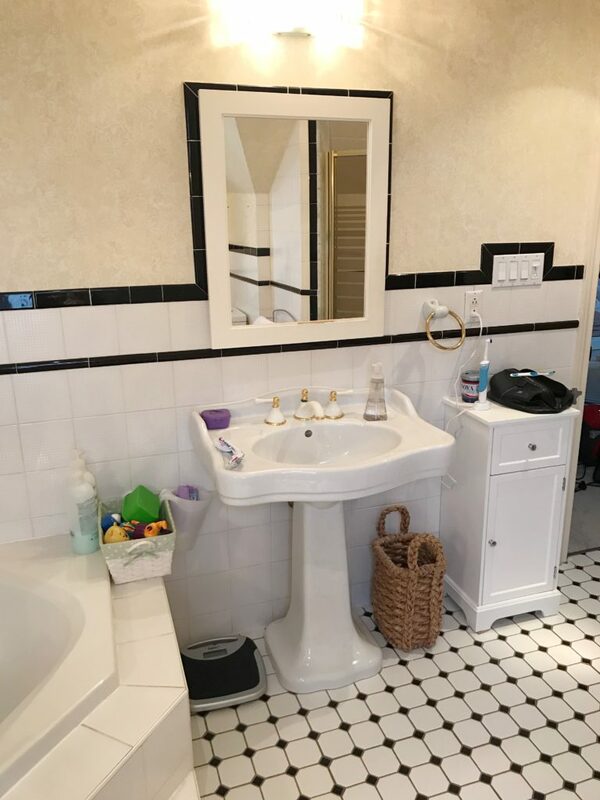 So, in this photo, you can see that the bathtub takes up a LOT of space! Having said that…I do love this tub. Both girls fit into it easily and it’s not unheard of for them to be in it for an hour complete with snorkels and masks! 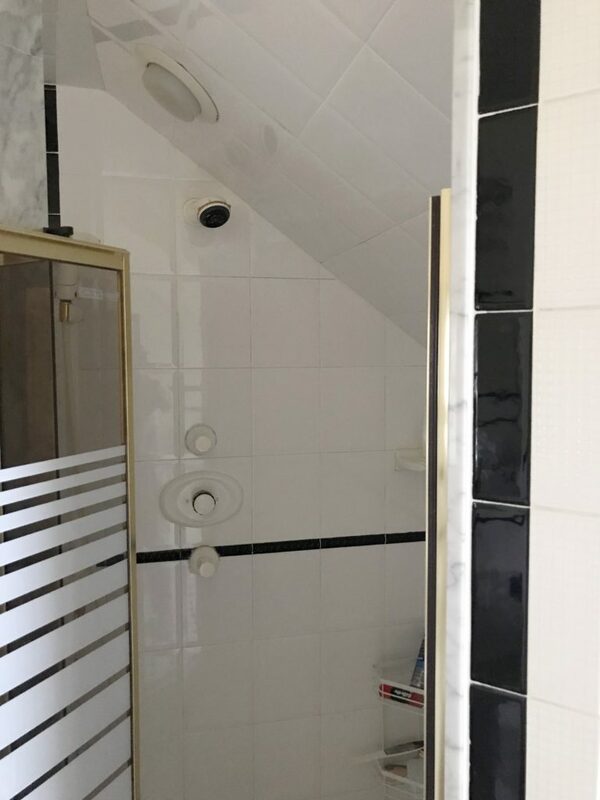 OK…the shower…looking at the pic you might think…meh…not tooooo bad….but let me tell you. Steve is 6’2″ and has to stand with his head at an angle. LOL…when we first moved in – until he got used to it – I would often here a curse when he banged his head first thing in the morning. We definitely needed to address this area of the bathroom. 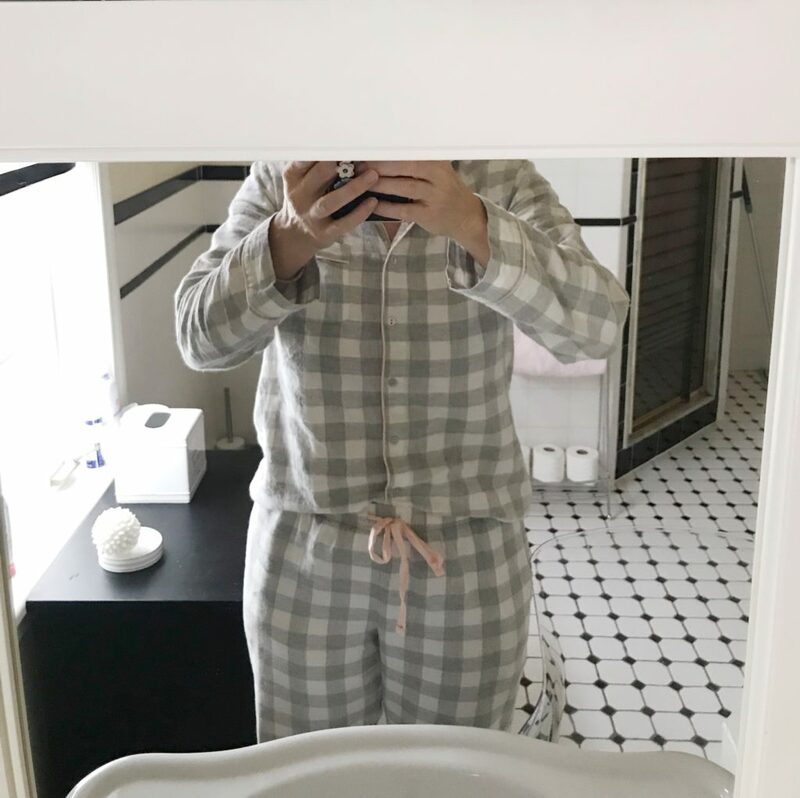 …when I looked into the mirror this was my view. Both of the ladies that owned the house before me were much smaller than me LOL…when I looked in the mirror I only checked on the ‘girls’, not my lipstick!! So needless to say this was another area to give some thought to. You can see that directly to the right of me there is a ghost chair. I would sit on it to brush my teeth and do my hair…I might actually miss it. Kind of a lazy way to primp. Steve’s mirror wasn’t much better. It wasn’t quite as bad/low as mine. 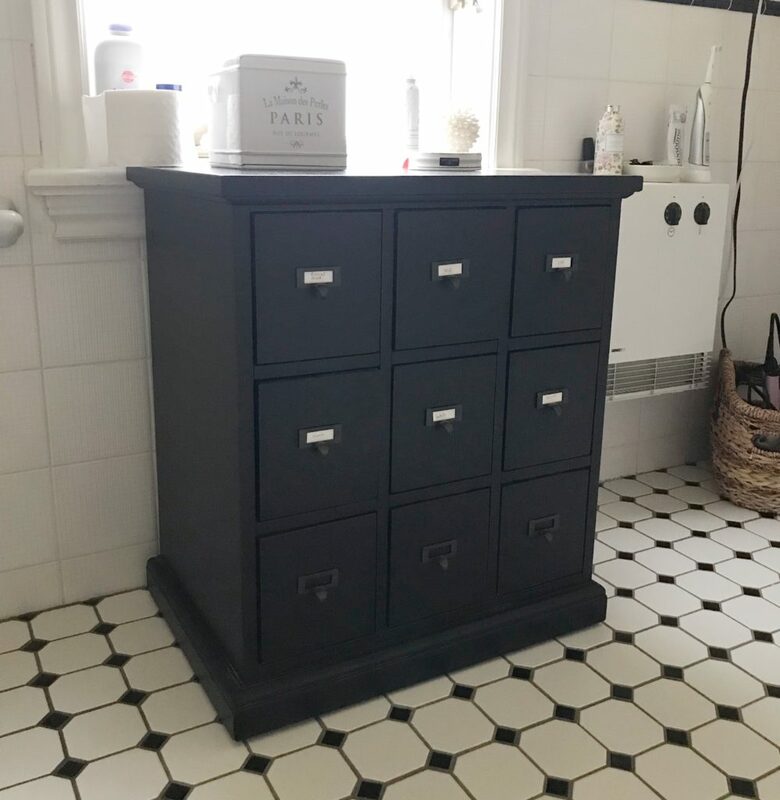 You can see that I had to add a small storage unit to house some of his toiletries. The girls’ tub toys had their permanent place on the side of the tub. This was the majority of our storage. Each tiny drawer had its purpose. At least it was all very organized. Another reason I didn’t hate this room. 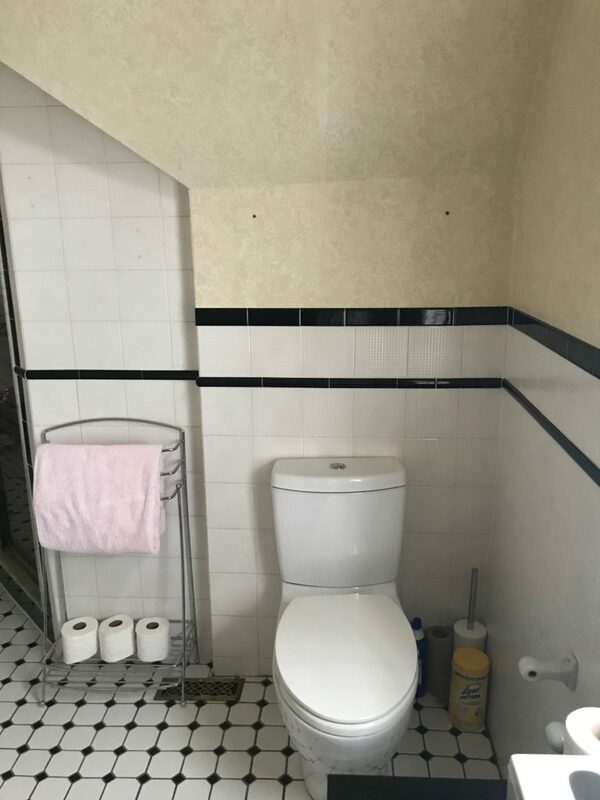 If you look closely to the left of the toilet you can see that the floor has a bit of hill. LOL…The toilet always sat crooked…and again no storage for cleaning supplies or the backup TP. I did end up using this toilet in another powder room that had a very old school super low profile toilet. This is my inspiration picture. I can tell you though that I was not able to find a vanity in this colour in the short period of time I had to pick everything out. This entire project was decided on in late December and started in Feb. Not a lot of time to pick and choose and get it all ordered and delivered. I chose a white one that I can always paint at a later date. 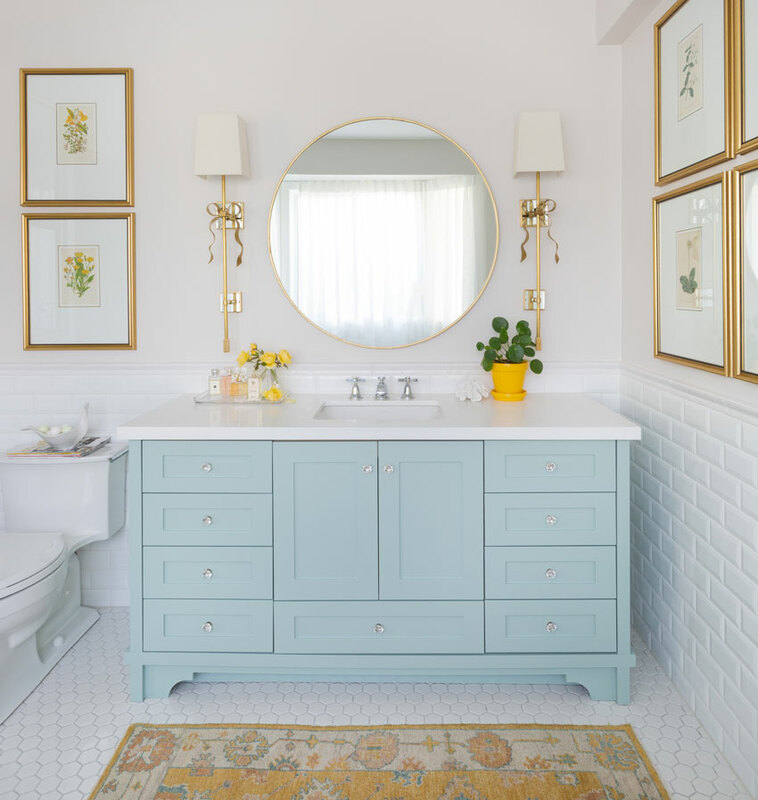 I love the brightnesses of this bathroom with the gold finishes. 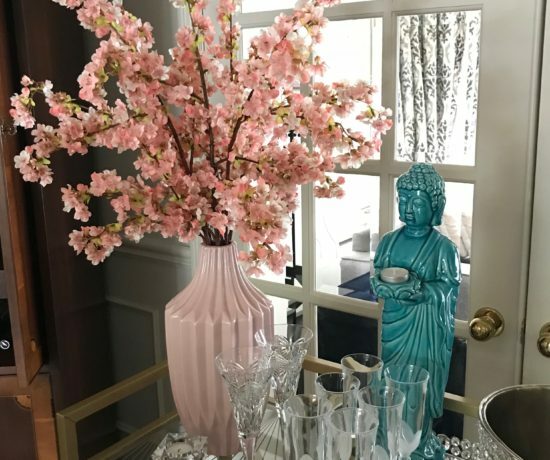 I did source these Kate Spade light fixtures…but the cost was ridiculous and then even more rediculous when I converted to Cdn dollars and shipping to Canada. I chose some that were close enough. I don’t typically go with what’s trendy…but if/when the gold is outdated changing these accents won’t break the bank. I love the look. There was no turning back. I was nervous when I received this photo. A part of me wished that I was home over-seeing it all. Like I said earlier though…my son was doing it and I know how amazingly talented he is. I kept looking at his Facebook page (you can follow/like him at Woodridge Renovations Inc) to see his past jobs to remind myself that I was in more than capable hands….and PS…I got the call yesterday that it is 100% complete. Plumbing and electrical have been inspected by professionals along the way “and mom I made sure your house is spotless” and we are good to go. A small little part of me wants to go home to check it out….lol…but I am going to resist and see it at the end of April. Just like the HGTV shows…there is ALWAYS something over and above. This is why our floors were so cold. No insulation at all right above the front entrance which is under the bathroom window…plus these wires were live! It was a potential fire hazard for sure. 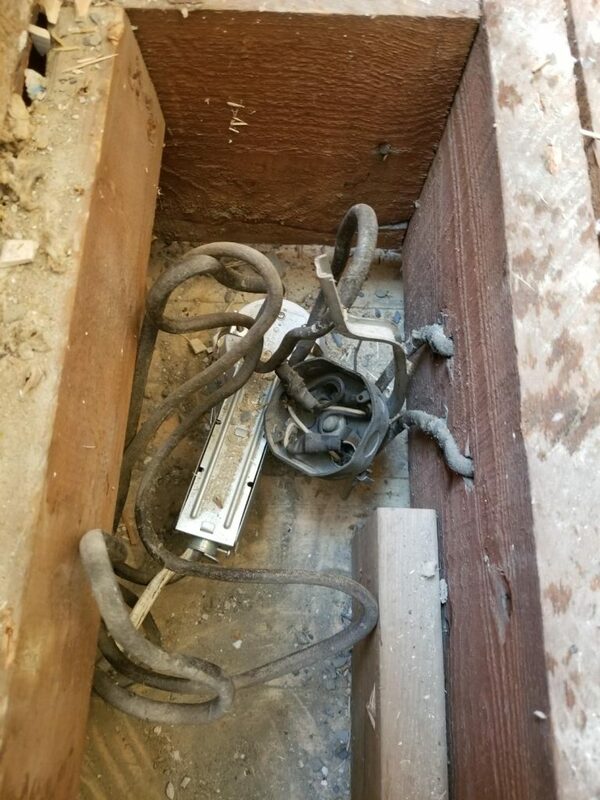 I am so happy he found this and got it all looked after by a licensed electrician. 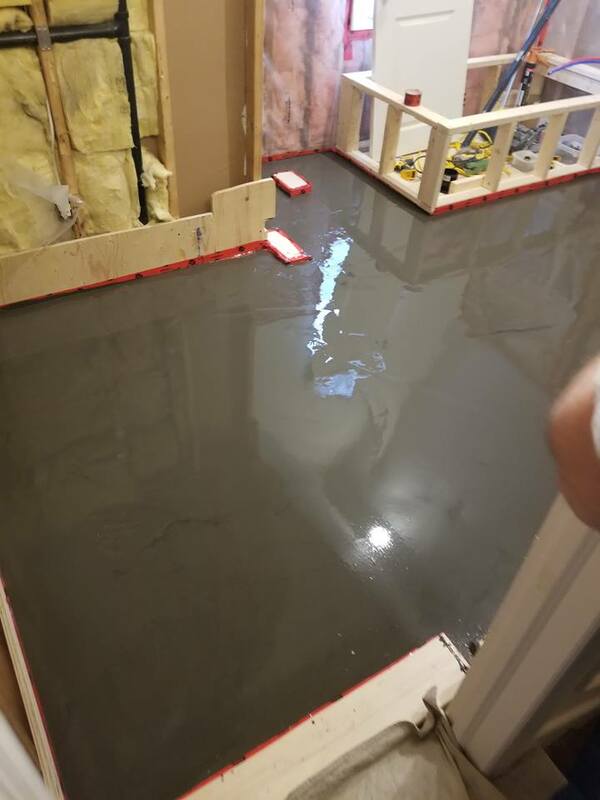 A little self-levelling cement…no more hills in this room. Smooth, smooth, smooth…Did I mention that he put in heated floors for us too? No more ugly wall heater. YAY!! Left of the entrance is where the double sink vanity will go and directly across from the door is where the old shower used to be. All of the yellow wallpaper has been removed. Tub and shower thingy is in! This is going to be a terrific surprise for me when I get home. I have seen some snapshots here and there…but it is all very exciting. So stay tuned my Savvy followers. I will be posting the full makeover in May once it is all set up with so much prettyness…I cannot wait. Love the inspiration photo. Can’t wait to see the finished product. We did bathroom Reno 10 yrs ago and we put in heated floors with blue Mexican tiles over them . It’s always a joy to step into them, especially on cold wintery nights, and with the thermostat turned lower they’re cool in the summer if you like. ooohhhh….blue floor! Sounds amazing. We had heated floors in our last bedroom/bathroom and they were heavenly!! I cannot wait to see the finished product myself!!! LOL…Steve is heading home next week and he is NOT allowed to send me any photos! I want it to be like Christmas morning! Thanks for stopping by Marion. How great to have your son work on this while you are here. Love the inspiration photo, I’m sure it’s going to be great. look forward to seeing. 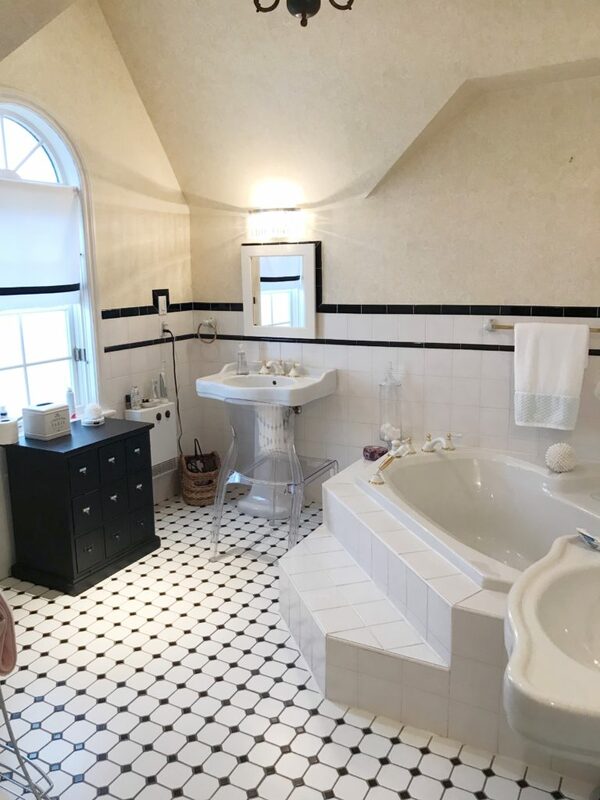 Is that bathroom from a Maria Killam’s blog? It looks like her gorgeous, oh so feminine bath. That is a lovely inspiration picture. I saw your comment on Citrine Living and so popped over to take a look around. Hi there Joanna. Thanks so much for stopping by. I am honestly not sure where it came from. I had been holding on to it for a while. Funny, you should mention Maria Kilam though. My girlfriend Sharon took her colour course and just renovated her home using what she learned. 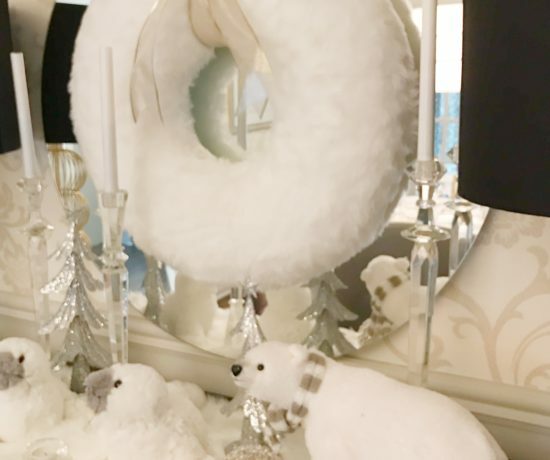 I am going to do a blog post on Sharon’s reno….and just found out the Maria did one on her as well. I hope you stick around and hopefully enjoy my blog. Have a wonderful day. Hi Tamara…It’s you again!!! My idol!! LOL…It was a big project…but having my son as my contractor helped ease my mind. My husband was home a couple of days ago and he gave it 2 thumbs up!!! I am actually thinking of leaving Florida early to go home and see it!! LOL…except it’s still too d*** cold for me! I am just going to have to be patient for another few weeks. Thanks for stopping by and saying hello. It really means a lot to me. Can’t wait to see it all done!! !